1 Peter 2:1-8 (NIV) “Therefore, rid yourselves of all malice and all deceit, hypocrisy, envy, and slander of every kind. 2 Like new-born babies, crave pure spiritual milk, so that by it you may grow up in your salvation, 3 now that you have tasted that the Lord is good. 4 As you come to him, the living Stone—rejected by men but chosen by God and precious to him— 5 you also, like living stones, are being built into a spiritual house to be a holy priesthood, Offering spiritual sacrifices acceptable to God through Jesus Christ. In the book of Haggai God challenges the Hebrews to think about the former temple, the one that was built by Solomon? It was a building of splendour beyond the proportions of anything else. They then look at the new temple and it seems like nothing. But listen to God’s view of things. He says in Haggai 2:9 “The glory of this present house will be greater than the glory of the former house,’ says the Lord almighty. And in this place I will grant peace, ‘declares the Lord Almighty.” You see, with God it is not about the building programmes or the facilities we have, but about His glory and the extent to which we are willing to offer spiritual sacrifices. Make no mistake, God can allow us by His grace to build buildings. And it is also true that buildings can serve the purposes of God’s glory, but a true sign of God’s grace lies on the spiritual level, rather than in bricks and mortar. The Temple Haggai built was no comparison to Solomon’s temple on the exterior, but God’s glory was to rest upon it. In the same way Christianity is deeper, it is spiritual, it is about living stones serving and loving the Living Stone. The church is not just about bricks and mortar, it is not about decisions for Christ, walking isles, praying a sinner’s prayer or even acting spiritually. It is even more than claiming to know Christ, it is about growing up in Christ to become a Spiritual house offering spiritual sacrifices acceptable to God. Let’s stop here for a moment and test ourselves. Are we offering up spiritual sacrifices acceptable to God? Are you maybe into doctrine alone, but there is no life? Are you into life alone, but there is no doctrine? This will affect your spiritual sacrifices radically, because spiritual sacrifice is an on-going process and it needs to be done right – and whenever doctrine or life or both are missing, our spiritual sacrifice is going to be affected as well. Paul reminds us in 1 Timothy 3:15 (NIV) “15 if I am delayed, you will know how people ought to conduct themselves in God’s household, which is the church of the living God, the pillar and foundation of the truth.” Yes, we are God’s household, living stones, living members serving a living God, by offering spiritual sacrifices acceptable to God, and it is only acceptable to God because the church is the pillar and foundation of truth, that is why we like babies crave the spiritual milk so that WE can be built up instead of just building buildings. I want to approach this text from two angles over this school holiday period. Firstly, what are some of the spiritual sacrifices that are expected from us, more than contributing to bricks and mortar? Next week we will get to a second point where I want to ask the question: what are the pillars that our spiritual sacrifice rests on, that are more than bricks and mortar? You see the reason you are maybe not offering the spiritual sacrifices you ought to might just be because these pillars are not in place. Surely we want to be a church that is acceptable to God. Well I believe if we understand these two points and apply them we are right up there. Today, I want to look at “Spiritual sacrifices pleasing to God”, and then in my next sermon we will look at the pillars they lean on. If our goal according to Peter is to be living stones, built up into a spiritual building as a holy priesthood offering spiritual sacrifices, ‘what are these sacrifices’? Let me mention 3. 1.1 Our bodies as a living sacrifice. Romans 12:1 (NIV) “Therefore, I urge you, brothers, in view of God’s mercy, to offer your bodies as living sacrifices, holy and pleasing to God—this is your spiritual act of worship". After 11 chapters of doctrine, Paul starts where we all should start and that is with a life of worship. He starts with us offering up our bodies, –us– as living sacrifices. In verse 2 he gets to the mind but in verse 1 he starts with body. You belong to God, both in body and in mind or not at all. Now you might ask, why does God want my body? Look at it, it’s overweight, or underweight, wrinkled, blotchy, achy, blind in one eye, deaf in one ear, nose too big – too small, too young, too old, impulsive, unattractive, awkward, disabled, near-sighted, hard-of-hearing, stiff and so the list goes on. I mean, what kind of sacrifice is that? The Jews were to offer up unblemished sacrifices I just don’t think I measure. We must not miss the point. The sacrifice of our bodies to God is not a sacrifice for sin. That is done already in the sacrifice of Christ. That is the only reason why bodies like ours are acceptable. Peter makes this really clear in 1 Peter 2:5 which we have just read a few moments ago: where he says something similar to Romans 12:1: “Offering spiritual sacrifices acceptable to God" – then he adds these words: “through Jesus Christ.” It's because of Jesus that our sacrifices to God are acceptable. It is because of the mercies of God that Paul has explained to us in the first 11 chapters of Romans that we can offer up our bodies a living sacrifice. God has been merciful to us through the death of Christ and we are now no longer under condemnation, therefore you do not need blood sacrifices anymore, no – now we offer up our lives, our bodies as living sacrifices. God does not want your bodily looks but your bodily actions. What does this mean? It literally means that everything that you do with this body 24/7 is to be done as an act of worship to God. Whether you eat or drink or what you do at work or on the sports field -- whatever you do with your body do to the glory of God. That is where your spiritual act of worship starts. You know we so easily offer up these bodies as sacrifices for fun, for sport, for work, for entertainment, and so the list goes on. What God wants from you is your spiritual worship. I believe Paul illustrates it well in Romans 6:13 (NIV) “13 Do not offer the parts of your body to sin, as instruments of wickedness, but rather offer yourselves to God, as those who have been brought from death to life; and offer the parts of your body to him as instruments of righteousness.” So what Paul wants you to understand is this – 1 Corinthians 10:31 (NIV) “31So whether you eat or drink or whatever you do, do it all for the glory of God. That is your spiritual act of worship". 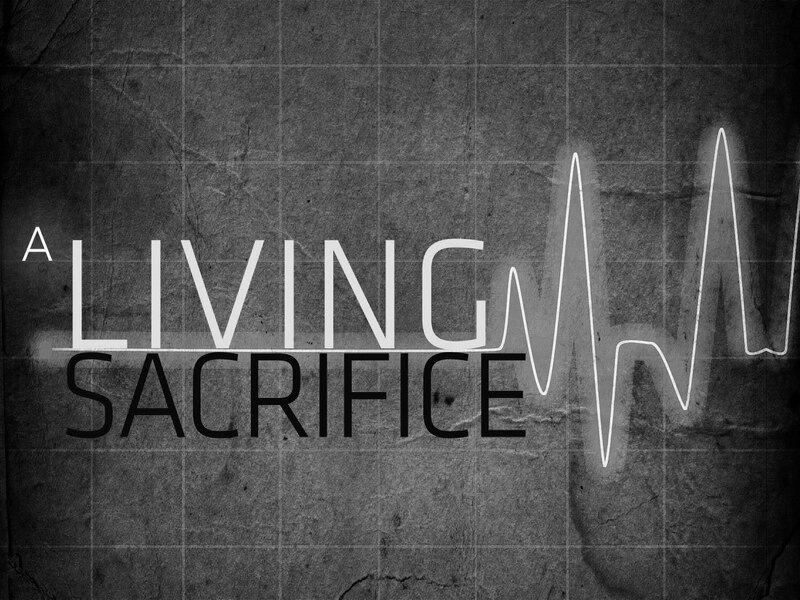 1.2 Our praise as a living sacrifice. There is something more that we are taught about a spiritual sacrifice and that is the spiritual sacrifice of praise, which includes singing and speaking our praise to God. Hebrews 13:15 (NIV) “Through Jesus, therefore, let us continually offer to God a sacrifice of praise—the fruit of lips that confess his name." Sadly, the praise of so many people for God stops in their hearts. The Hebrew writer says that it must be fruit of lips. One of the reasons that so many Christians lead such weak and unhappy and ineffective lives is that this exhortation is disobeyed most of the time. Ask yourself, does the praise of God ring from your lips continually? Are you here whenever God’s people gather for worship? I’m a pastor, so you might say that I am here because it is my job, well I know myself before I was a pastor. But let’s use my wife as an example. She is a teacher – I want to tell you I will have major problems with her if she said that she loved the Lord her God with all her life, but when the believers are gathered she is at home with her nose in her books – it is the fruit of lips. So the spiritual sacrifices are the praises and thanks of God's people alone and in group worship. 1.3 Our giving as a spiritual sacrifice. There is one more level of Spiritual sacrifice I want to touch upon. It is the sacrifice of acts of loving, giving and sharing. For example, in Philippians 4:18 (NIV) Paul receives gifts of support from the Philippian church and says, "I have received full payment and even more; I am amply supplied, now that I have received from Epaphroditus the gifts you sent. They are a fragrant offering, an acceptable sacrifice, pleasing to God." Now remember Paul was in one sense an individual committed to the work of ministry and he needed the support of the people to do the work of ministry. Over the years the church has formed into local congregations that have organised themselves for effective ministry and very soon in history they started owning buildings and employing people to assist the purposes of the local congregation and support in one sense became more critical. There is a monthly budget for ministry. I know many are struggling, but I still believe there is enough amongst God’s people for the work of ministry. The question is where are our sacrifices of offering finances going to? Is what we are doing with our finances pleasing to God? Oh how we would like to say with Paul, “we have received full payment”, “we are amply supplied”. Let us think in terms of our own giving. Are we offering spiritual sacrifices acceptable to God? How does God look at our giving? Think about the context of Malachi where God looked at the sacrifices of His people with disgust. Remember what they did. They would go through their animals and pick out the sick and the lame, because let’s be honest, we are going to burn it in any case. God asks them a very simple question. Will you give it to your governor? Why must God always be happy with the second best? Somebody from another church said to me a while ago that they cannot really give to their local church now, because they just simply have too many investments and properties that need to be kept intact, but not to worry they have left a sizable part of their estate to their local church. The guy said to me: “just wait till I’m dead and you will see”. I had to remind him that I’m 10 years older than him and might not see. Others again will give that what they do not have. Just wait till I win the lotto and I will give, or I had this e-mail, and I am about to win millions of Rands. When the Nigerian scam pays out, I will give lots. The story is told of the comrade in Russia who was visited by the KGB. The KGB officer asked him, that if he had 20 million Roubles if he would give it to communism? To which the man replied, ‘ya sure’! Then he asked him if he had a wife and four kids if he would give them to the cause of communism, to which he replied in the affirmative again. Then he asked him, that if he had a farm, would he give that to communism, to which the man again replied that, he surely would. Lastly the officer asked him that if he had a donkey, if he would give that to communism? The man looked at him and said. Now you are unfair, you know I have the donkey. Can I challenge you for a moment, to be fully committed to giving to God’s work while you are alive, and with what you do have? Don’t wait till you are dead to make an impact, do it while you have breath and you can stand and watch and glorify God. I am not saying that you cannot leave money in your will for the work of the Lord. Many do that with great success. But it is not just our giving to the local ministry of the church, but our caring for one another. Hebrews 13:16 (NIV) “and do not forget to do good and to share with others, for with such sacrifices God is pleased.” Now this is not just finances. That meal we shared, that help we give one another as brothers and sisters in Christ are sacrifices to God. Let me end this sermon with a few simple questions. Church family, when you are sacrificing, you do not care about reputation. Some will like you, some won’t, some will love you, others will hate you, some will enjoy you, and some will despise you. The question today is this. How does God see you this morning? Are you the aroma of Christ, are you offering up living sacrifices? If not, you have an issue to sort out with God and I invite you to do that for His glory. Next week we will look at the pillars they are built upon.